Get Invisible Braces Treatment – Get that charming Smile! You can create a wonderful first impression about you, when you exchange a beautiful smile with anyone. Your teeth play a vital role in contributing for a ravishing smile. We frequently watch the perfect set of teeth that models and movie stars have and wonder what would be their secret formula of keeping teeth so wonderfully aligned. We have an answer for your teeth problems. Many people around us have deformed teeth and they are afraid of smiling openly with a thought of being a topic of laughter among others. Well we can ensure you about getting total control on your teeth and confidence with our globally proven Invisible braces treatment. The whole purpose of this orthodontic treatment is to regain teeth alignment and improve your face value. As always with orthodontic treatment, if wisdom teeth removal is needed during or after treatment we can also now help you with our partnership with the Wisdom teeth professionals. We are proficient Invisible Braces treatment providers in Sydney. Clear Correct is a complete treatment of rectifying your teeth’s alignment. It is the latest technological innovation in dental science and all treatment aspects are planned in 3D imaging method. In fact, before we begin with your treatment, we can show you the stimulated model of the treatment on computer. This gives complete insight on how your teeth are and how the change will reciprocate after the treatment. Conventionally, metal braces were practiced and were highly popular in the past. With Invisible braces in Sydney, the whole paradigm has shifted and we are proud to be an important part of it. Perfect and Pristine Smile, Guaranteed! ​Clear Correct are completely invisible teeth aligners and have great benefits when compared to other methods. Our Invisible Braces treatment proves to be an ideal solution to rectify crowded teeth, These invisible teeth aligners work on a unique principle for realignment. Understanding your dental pattern is the beginning of the treatment. A 3D model of your dental bite impression is created with a laser scanner. We decide and discuss the expected results with you and then plan the developmental models of aligners. Based on these computations your final set of clear aligners is created. These aligners change your teeth’s alignment progressively. They are completely safe for everyone and even during sports, there are lesser chances of getting injuries as metal wires are not used. Clear Correct treatment is completely safe for any age group and gender. With our expertise at hand, we ensure the perfect treatment. In fact, we also open several avenues to suit treatment expenses to your budget. You can opt for monthly payment plan or some other plans designed by GE Care Credit to support you for the dental expenses. All you need to do is begin with the treatment, wear Invisible clear aligners at least for 20 hours a day and feel the difference. Clear Correct does not interfere with your looks as it is completely transparent and is snap fit. You will be amazed after seeing the results and your smile will be the certification of our efforts. We will also help you to maintain the treatment with regular check ups and wisdom teeth removal if necessary. 1. Appearance: A major reason why invisible braces are opted by teenagers and adults alike is its appearance. Conventional metal braces can impact the confidence of people who use them, however invisible braces resolves this problem and make way for a natural look and smile. 2. Comfort: When it comes to dental hygiene, comfort is important. Unlike metal braces that causes discomfort and pains, invisible braces are way more comfortable to use. 3. No Diet Sacrifices: Invisible braces give you the freedom over what you want to eat. Metal braces might break when eating hard and chewy foods, and food might even get trapped between such braces. 4. Maintaining Oral Hygiene is Easy! The positioning of invisible braces simplifies cleaning and maintenance of your teeth. This lets you maintain healthy teeth and gums, and eventually good oral hygiene. ClearCorrect aligners are made with clear plastics, thus making them virtually invisible! No more worrying about your appearance, for ClearCorrect offers you the same functionality as traditional metal braces. Being made from soft plastic, ClearCorrect is not going to cause pains and discomfort of any sort. They do not cause irritation to your gums and cheek too. 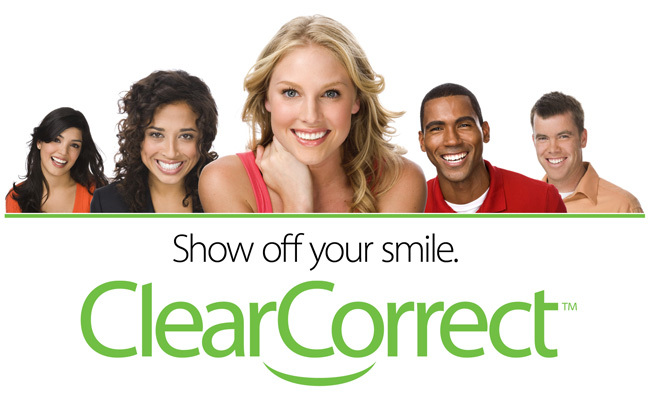 ClearCorrect is designed to match with the shape of your teeth. As your teeth gradually align to its actual position, invisible braces begin to fit less perfectly during the course. Your dentist will customise new pairs of aligners continuously to make the treatment as speedy and effective as possible. The one thing that causes agony amongst the users of metal braces is that it cannot be removed unless the treatment is complete. ClearCorrect isn’t made of wires, which means you can remove them and put them back anytime you want. An initial assessment of your teeth will be done. Your dentist will take a mould of your teeth alongside a few images of your teeth and smile at various angles. Your dentist will analyse the movement of your teeth and uses simulation software to determine the design of aligners for you. Once the aligners are ready, they will be offered to you for treatment. Be sure to place your aligners correctly. Insert the lower aligner first and then the upper aligner. Aligners should be worn for around 22 hours every day for effective results. Remove the braces while eating, flossing and brushing. Change your aligners every two weeks to produce fast results. What are the costs of Invisible Braces in Australia? The cost of invisible braces is charged depending on the specific needs of patients. The factors that determine the cost include the longevity of the treatment process and the severity of teeth alignment problems. That being said, Cost of Invisible Braces offers cost effective invisible braces treatment starting from as low as $1650 (both arches) with a maximum capping of $4850. If you are a member of a health care fund, most part of the treatment price will be covered for you. Are you an Authorised Provider of ClearCorrect Clear Aligners? We are an established dental clinic serving Melbourne, Sydney and other prime cities, having an aim to offer high quality dentistry for patients. We are an authorised provider of ClearCorrect invisible braces that has helped in giving our clients a perfect smile and in enabling us to build a strong reputation in every city we serve. How much do ClearCorrect braces cost? The cost of ClearCorrect clear aligners varies anywhere between $2000 and $8000 USD, depending on the complexity of treatment, your location and other relevant factors. However, you can buy them from us at a fraction of the price! Are ClearCorrect Clear Aligners cheaper than braces? The cost of ClearCorrect Clear aligners is nearly similar to that of traditional braces, however ClearCorrect invisible aligners brings you a host of benefits such as convenience of usage, customised solutions, fast treatment and comfort of aligners being invisible.